580 ESS SRI LANKA (1983) Ceylon White-Eye (Zosterops ceylonensis)*. Series of 5 progressive imperforate proofs. Scott No 692, Yvert No 661. 581 ESS SRI LANKA (1983) Ceylon Coucal (Centropus chlororhyncus)*. 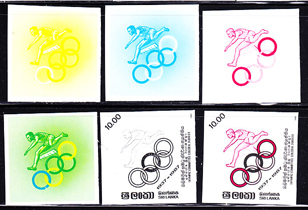 Series of 5 progressive imperforate proofs. Scott No 694, Yvert No 663. Also available as pairs. 9681 ESS SRI LANKA (1983) Dusky-blue flycatcher*. Scott No 693. Yvert No 662. 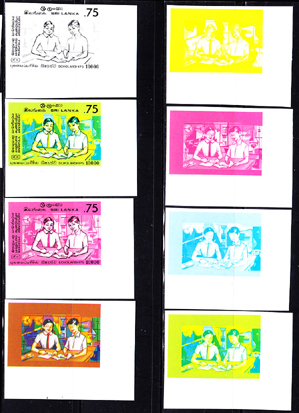 Imperforate Color Proofs in 2 corner blocks of 4. One block is unicolor in blue-violet and the other is close to the original. **. Hard to find! 3937 ESS SRI LANKA (1986) Students studying*. Set of 8 progressive proofs. Scott No 778, Yvert No 740. Mahapola scholarship program. 5422 ESS SRI LANKA (1987) Hurdler*. Set of 6 progressive proofs. Scott No 835, Yvert No 815. National Olympic Committee.